Instead of lounging by the water, beachcombers everywhere could have spent their sun-soaked vacations skipping happily through the sky had a long-lost pastime only survived the test of history. The archives of popular science magazines reveal high hopes for a hobby that emerged to fanfare in the mid-1920s, but would quickly fizzle out. 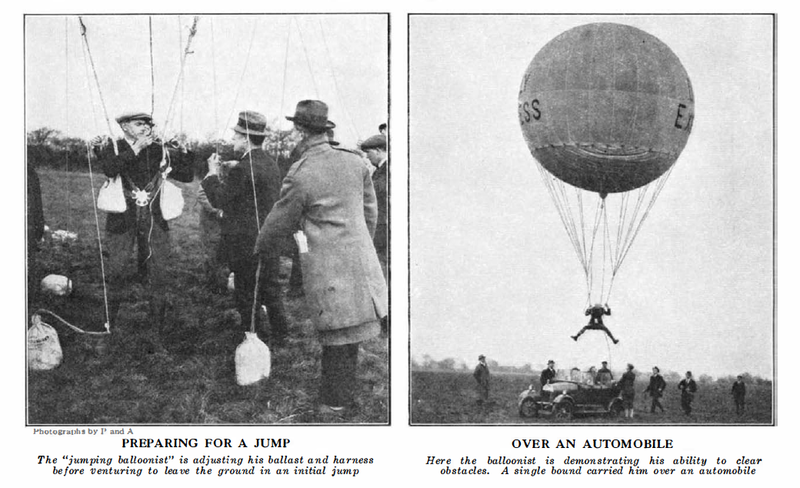 It’s called balloon jumping, and the concept was pretty basic: Jumpers, also called “swimmers,” were strapped into a harness that was attached to a helium balloon. The balloon provided just enough boost to lift them off the ground as they leapt, but not so much that they drifted off into the clouds. To achieve this, the jumper had to maintain negative buoyancy, or a heavier weight relative to the air that he or she displaced. That sweet spot was met when the balloon supported all but about four pounds of the jumper’s body weight. Graced with the ability of almost-flight, the balloon jumper could then skip gleefully across a landscape, clearing cows and small trees along the way. 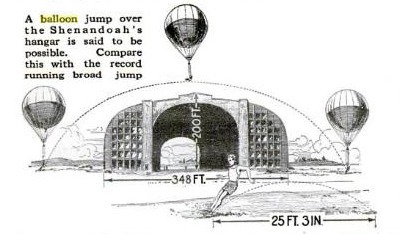 The illustrator of the title image pulled from a 1927 Scientific American article introducing the new trend notes that the average balloon jump was 300 feet long and 40 feet high. In the below image (pulled from that same article), a man jumps over a car with ease, even splaying his legs for good measure. Jumping over cars was just the beginning — one confident navy sailor intended to balloon jump over the hangar of an early airship, the USS Shenandoah, according to a 1924 Popular Science article. The hangar of the blimp-like airship was 348 feet long and 200 feet high. An illustrator compared the length of this hurdle to the record long jump at the time, which was 25 feet and three inches. Aside from entertainment, the authors tried to find a practical value for the new hobby. Popular Science reasoned that the skies could be used for recreation just like seas and beaches, thereby relieving some of the miserable congestion at tourist hotspots like Coney Island. “‘Air beaches soon will be a reality,” the article stated. “Balloons will be hired, fitted and worn as roller skates or bathing suits are now.” The same article helpfully suggested that jumpers could even smoke while they cavorted, since helium is non-flammable. Balloon jumping admittedly came with certain hazards — jumpers could get caught in trees or power lines with an unexpected gust of wind or fall too hard if the balloon’s gas and ballast were thrown out of balance. For safety, the Popular Science article recommended tethering balloons to a track, so that folks on vacation who were attempting to balloon jump for the first time wouldn’t be swept away by the winds.